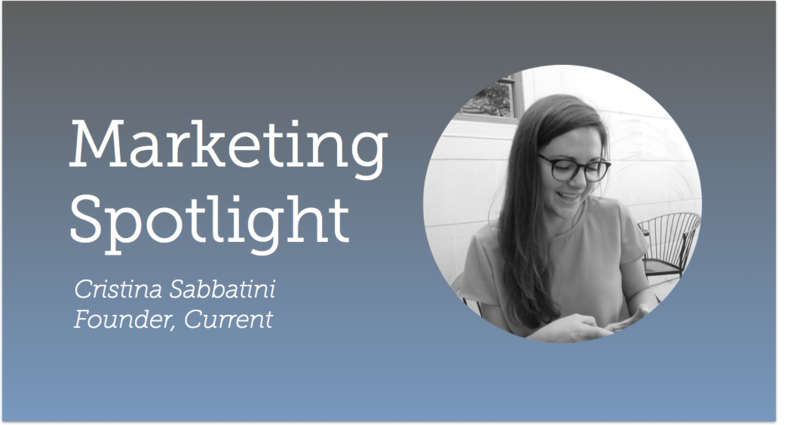 Cristina Sabbatini is a digital marketer with 7+ years experience. She’s worked in both New York city and Phoenix, at companies of varying stages including PayPal, ed-tech startup General Assembly, and digital agency Firstborn. She is now the owner and founder of Current, a digital marketing consultancy that specializes in paid media, content marketing, and marketing automation. Cristina, why did you decide to get into marketing? When I was younger I was always entranced with the checkout displays at grocery stores — the multitude of different gum packages. I remember my mom telling me that it was someone’s job to pick out these colors and names — something called branding. That caught me. So I got drawn into marketing because of a fascination with the concept of brands, but was more excited by the challenge and opportunities on the digital/technical side. A digital marketing course at ASU with Bret Giles my senior year, and an internship with Defero, the Phoenix-based digital agency. Hmm — the one issue I come across in every organization is the attempt to centralize data to get a complete picture on marketing spend. Everyone struggles with this. So this became a personal initiative I started looking into and working on — trying to figure out the easiest solution for companies to get this up and running. That’s how I discovered and became intrigued with HubSpot. And also how I met the awesome MWI team — we were both looking for answers to the same question and came upon HubSpot and the community here in Phoenix. I’ve also played around with and liked Klipfolio, and have heard great reviews on Segment.io, so for anyone who wants an intermediate solution, I think those would be great tools to investigate. Referral/former colleagues is actually how I’ve received the majority of my business, but I can attest to the effectiveness of paid media (both display and search), Twitter Lists, LinkedIn, and Instagram. All of those channels have driven quality traffic to my site, and even phone calls. I got a phone call on a Saturday by someone who found me through one of my paid search ads when I was running a small test. My total spend on that campaign was <$8, so it definitely works, and works well. I’ll just share a few quick tools I use and love: Google Search Console to see search terms people are using to come to your site, Google Analytics’ “compare to previous period” to quickly glean positive/negative trends, HubSpot Keyword Tool and Google Keyword Planner to identify content opportunities to write against. With individual channels (Facebook, MailChimp, etc) you can usually download an excel of any of your performance data, do a pivot table, and get benchmarks (average CPA’s, open rates, CTR’s, spend etc). So that guides my goal-setting. Which tools do you use to manage marketing initiatives? What is the biggest benefit of partnering or working with an agency? I’ve learned you can only do so much as one consultant. There’s a hard limit. Being able to work with an agency allows me to potentially help my clients in a bigger way (e.g. refer an agency that can handle SEO activity to compliment a content calendar I put together), and on the other side, it allows me to join or participate in larger projects/ brands that I wouldn’t be able to otherwise work with on my own. Actually — that more marketers are heading out on their own, and reaching out to/working with brands they like, thereby creating marketing teams that are more passionate about or have more conviction in the products, ideas, and services they’re marketing. Not a past failure, but maybe a current failure. I’m still trying to work on developing some sort of digital product that I can offer. This is one way I’d be able to grow within the constraints of limited hours. I haven’t been able to crack this, but I’m still thinking about it! A guest presenter in my Services Marketing class in college taught us the term “autodidacticism” — which is the concept of self-education or being able to teach yourself something. Lots of what we want or need to know we’re smart enough to teach ourselves. I had a good marketing friend tell me she wanted to develop a stronger grasp of SEO and did it by laying out a plan which included watching at least 1 SEO YouTube video a day for several weeks. Such a small daily action that has had a significant impact on her career, even after just a month. So pick something you really want to understand better, set some sort of structured learning plan for it, and work your way through it. Yes — make sure your landing pages have your target keywords/long-tail keywords in the URL. This helps from an organic search standpoint. Related — if you change a highly-trafficked page’s URL, make sure you investigate a 301 redirect on the old URL, to retain/pass through your PageRank. I try to schedule everything on my calendar — whether it’s writing a post, reaching out to someone, completing a course, reading a guide I downloaded, etc. so that I can be realistic and prioritize what I work on each day. Getting More by Stuart Diamond – which is about negotiating. Startup of You by Reid Hoffman.